Whether you live here or are just visiting, don’t miss William P. Quinn’s program on shipwrecks off the shores of Cape Cod. The author and former news photographer shares his wealth of knowledge with our audience. 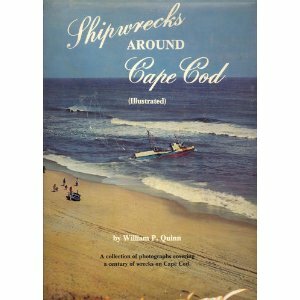 Quinn has written several newspaper articles and books on shipwrecks, including Shipwrecks around Cape Cod. Drawing on both his years of historical research and his job as a professional news photographer along the New England coastline, he has countless tales to tell. Some of the disasters he has photographed are the sinking of the Italian luxury liner Andrea Doria in 1956 and the grounding and subsequent loss of the tanker Argo Merchant in 1976. Freelancing in the field of television news, Quinn comes by his interest in shipwrecks virtually by inheritance. His grandfather, William H. Quinn, a Nova Scotia fisherman, was washed up on the sands of the outer beach at Eastham in the 1880s, a victim of a shipwreck. He stayed on the Cape and married into the Higgins family. Bill Quinn, the younger, is married and has two sons. He is a veteran of four years of naval service in World War II with duty in the South Pacific and lives in Orleans.